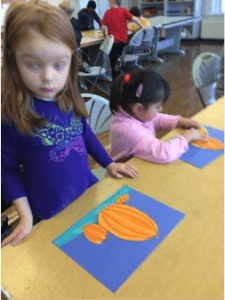 For the month of October we have been engaged in a variety of fun learning activities. We have dedicated a lot of time is developing Playground Expectations when we are on the playground during recess. Working in groups students thought about what the behaviour expectation looked like at the swings, slides, monkey bars, fence, poles, nets, rink and the shed. We wrote short statements about Being Respectful, Being Safe and Being a Learner. This was harder to write than we thought! We have been using our ideas and creating short video clips using Do Ink Green Screen. Avery tells us this project is harder than taming a lion. Hopefully this video will be released soon! Another theme we have explored this month is celebrating ourselves and our identity. We have discussed what makes us the alike, different and unique. 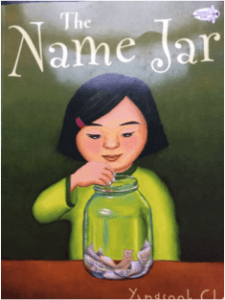 Some books that we have read are the Name Jar, I Like Myself, and Looking Like Me. Additionally we have learned what it means to be kind. We have read Only One You, and Adrian Simcox Does Not Have Horse. An important message from these books is sometimes you have to learn how to see kindness. We are not only readers in Room 16 but writers with many things to say. If you come by our hallway you will see our “ I’m So Smart” poems posted on the bulletin board. Along with these poems are our Picasso Portraits that we did with the Arts and Culture teacher, Madame Bento Teves. In these self portraits we learned about symmetrical and asymmetrical. Some of us found it challenging to make our faces asymmetrical when we have previously been working to make our faces symmetrical! 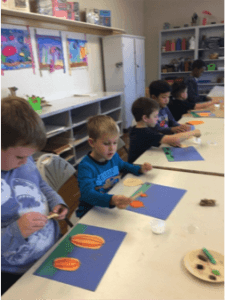 Our art teacher, Ms Vik showed us how to draw pumpkins and blend chalk pastel colours with our fingers. 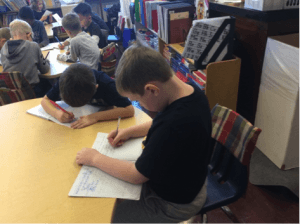 Room 16 students have also been writing every day in their Writer’s Notebook. Some students have written very long stories. Our goal is to publish them. We started gathering ideas for writing and sorting them into different pockets. One pocket is our Memory Pocket, another is our Fact Pocket and finally our Imagination Pocket. Mya’s idea about what it would be like to ride a unicorn would go in her Imagination Pocket. What idea to you have in your pocket? We have been working on using good leads to hook our audience and juicy words. We had a chance to examine writing examples and noticed what good writers do. 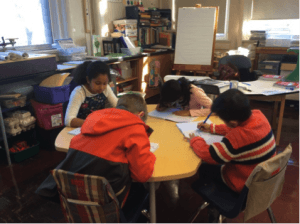 We worked in small groups to make suggestions about what the writer might need to do next. This will help us set goals for our own writing. 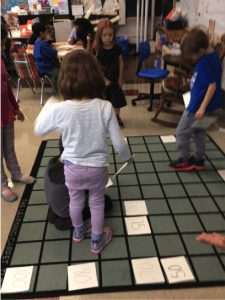 We have been choral counting by different numbers and looking for patterns. 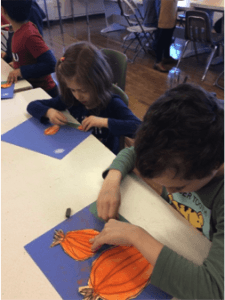 Grade ones have been making repeating patterns with shapes. Can you believe we have been at school for 39 days already! OOPS when we checked with Mrs. Jeninga’s class and found out that they were at 40 days of school, we had to go back and recount to find out we were off by one day already. TIME FLIES WHEN YOU ARE HAVING FUN!!!!! 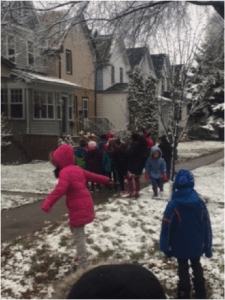 Have you seen us walking around the neighbourhood? We have been walking on most days for about 1km. 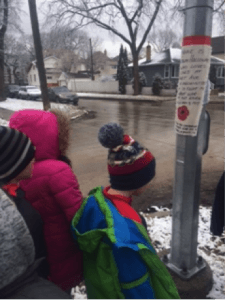 Today we noticed the canvas banners about soldiers who served in the Great War and located the houses that they lived at so long ago when they lived in our Earl Grey neighbourhood. The youngest soldier we have learned about was only 19 years old when hedied in the war. That’s only 11 years older than our grade 3s. Room 16 had a great month. We hope next month will be another fantastic adventure in our our learning.